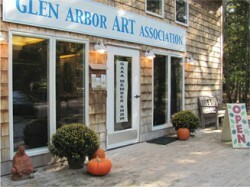 The formation of the Glen Arbor Arts Center is a story of the talent and enthusiasm of a few people who wanted to see the work of area artists celebrated and promoted for all to enjoy, by teaching classes, organizing exhibits and holding events that promote understanding and appreciation of the arts. In 1983 local artists and art supporters Suzanne Wilson, Ananda and Ben Bricker, Midge Obata, Becky Thatcher, Frank and Barbara Siepker, and others pooled their ideas and energies to create the organization. 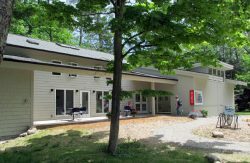 Over the years many other talented and dedicated individuals have joined to carry on and enlarge the original vision to what the Glen Arbor Arts Center is today. As we celebrate the many changes the art center has undergone over the years, it is important that we take time to remember and to celebrate our beginnings – the visions and traditions our dedicated founders brought to the organization and those that have carried it forward. GAAC Board member Pam Lysaght has been digging into the archives and is writing the story of the GAAC. The first installment (below) takes a look back at the formative years and is posted here. Watch here for more installments in the future.